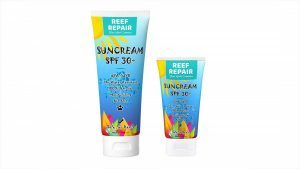 Reef Safe Sunscreen - A Simple Answer to an Urgent Issue. Have you been on holiday anywhere recently and been somewhat surprised that you were asked not to use sunscreen or sunblock before you go scuba diving, swimming or snorkelling? If not, it’s likely you weren’t on holiday in Mexico, Hawaii, Belize, The Great Barrier Reef (Australia), Seychelles, Maldives or the Similan Island’s (Thailand). 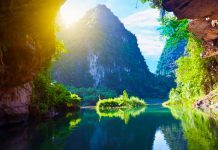 What these places have in common, apart from being beautiful holiday destinations, is that they have either banned or restricted the use of synthetic chemical sunscreens when engaging in any activity that takes place on or near their coral reefs. Those locations now require you to have or use reef safe sunscreen or a natural mineral sunblock that does not harm the coral and marine life. 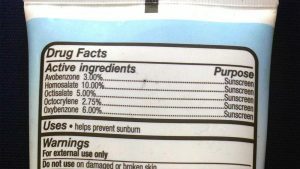 So what’s the big deal, what’s the problem with normal everyday sunscreen? Why are diving destinations in Thailand like the Similan Islands, Koh Tao, Phuket and Phi Phi taking sunscreen out of your hands on dive boats and what does it mean for your holiday? Normal sunscreen is annoyingly packed full of synthetic chemicals, we create them in labs; put them into our sunscreen and other cosmetics, spread it onto our skin and then indirectly let it enter into delicate ecosystems like those of our coral reefs. Here’s the kicker, some of those synthetic ingredients are so toxic to coral reefs that a single drop, can contaminate 6 Olympic sized swimming pools worth of water and make it utterly deadly for living corals. 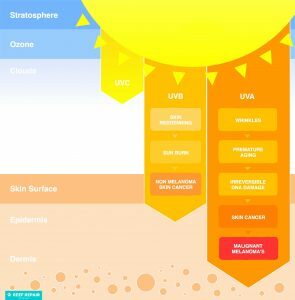 Two of the worst offenders that have thankfully been getting plenty of bad press recently are of course, Oxybenzone & Octinoxate, we refer to these types of sun care ingredients as active ingredients. An active sunscreen ingredient is simply an ingredient that gives you some form of UVA / UVB skin protection from the sun. Here is a quick list of the worst synthetic active chemical ingredients, avoid these in your sunscreen and other sun care products. If your current sunscreen or sun cream contains any of those chemicals above, that sun cream, sunscreen, sunblock is directly contributing to coral bleaching, higher coral reef infant mortality rates and this is the end result. You need to be looking for or using a sunscreen that contains natural mineral alternatives to the synthetic chemicals. These are usually Zinc Oxide and Titanium Dioxide based sunscreen’s and sun care products. 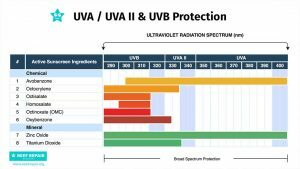 If you are wondering which one is best like many people, here is a graph to illustrate the effectiveness of all common sunscreen active ingredients, both mineral (safe for reefs) and chemical (reef toxic). Why Are These Chemicals So Bad For Coral Reefs? Imagine every day for breakfast instead of a nice tray of Bacon, Eggs and Orange juice; you got given a smoothie of your favourite cosmetic creams in a Lead bowl with a spoon made from Uranium. 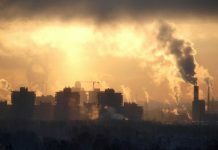 You might be able to consume your breakfast for a short while without too much of a health risk, but over time it will poison you because skin care products are not food, water leeches toxic chemicals from Lead pipes and Uranium poisons us. 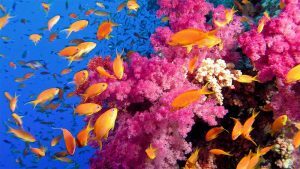 Coral is not much different actually; coral reefs are gigantic living organisms that require healthy clean water and nutritious food to live. Coral polyps which are responsible for the growth of the coral’s limestone structures feed on tiny organisms in the water which in turn have fed on the toxic chemicals we have introduced to the reef via sunscreen. To put this really simply, coral reefs are very delicate creatures; a lot like Millennial’s, very easy to upset and we can’t simply undo the damage with meaningful hugs; they take it personally. Want more science instead of cheap shots at Millennial’s, check out why sunscreen chemicals bad for reefs and humans, by following that link. If you don’t know what global warming is, you need to get out more. It doesn’t matter if you believe global warming is human caused or not, because our oceans are heating up1 and again a lot like Millennial’s, coral reefs can’t take the heat. Coral reefs require a steady water temperature, if it gets too hot for them; they quite literally get sick and die. 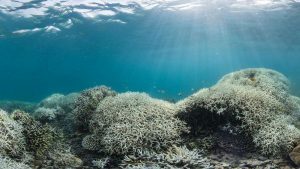 Most of the world’s tropical reefs need water temperatures of somewhere between 23 – 29 degrees Celsius, go beyond that and they are in big trouble, they bleach, and not long after, they die forever. Oxybenzone and many of the other synthetic active ingredients are directly responsible for lowering the maximum temperature which corals can withstand. What Can I Do as a Scuba Diver or Holiday Maker? Now for the good part, playing a role in the conservation of coral reef is becoming simple and easier. First and foremost the best action is to check your current sunscreen for any of these active chemical ingredients. If you find them in your sunscreen, throw it in the bin and stop endangering the health of the world’s coral reef systems. You’ve quite just literally helped save coral reefs from extinction, high five. But I Still Need Sunscreen Right? Of course, sunscreen is a daily necessity for many, especially if you have fair skin or work indoors on a computer writing articles about toxic sunscreen. 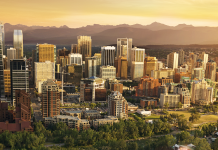 Protecting yourself from our sun is very important even when not on holiday, here is why. Malignant melanomas are seriously bad news, they spread cancerous cells to other parts of your body, and that can end in a very, very unpleasant way. So please protect yourself with a non-toxic sunscreen even if you are not swimming or near to coral reefs, go natural, be safer in the sun. Ok, so what are the natural reef safe sunscreen options, is there really a truly safe sunscreen and if so, where do I get it and for how much? Thankfully you don’t have to worry about any of those questions actually, because we did all the worriment and research for you, prior to writing this article. Can I Use Sunscreen While Diving In Thailand? At the end of the day, it is not illegal in Thailand yet as it is in Hawaii, though many dive shops, liveaboards and tourist boat operators will ask you not to use your regular sunscreen. 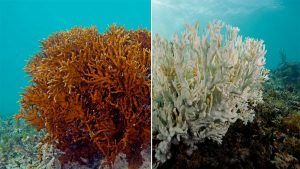 All that we ask, so you don’t get caught out, is that you educate yourself as you have done by reading this article on the effects chemical based sun creams has on our coral reefs. It’s extremely important that each and every one of us plays a part in the conservation of these delicate and beautiful organisms that we refer to as Coral Reef, so that they are present in the future for children and for fellow scuba divers. Let’s work together to promote safe environmentally friendly diving practices so that we can all keep scuba diving in a healthy living ocean, because without coral reefs, there is not going to be any scuba diving, and probably not much life at all.